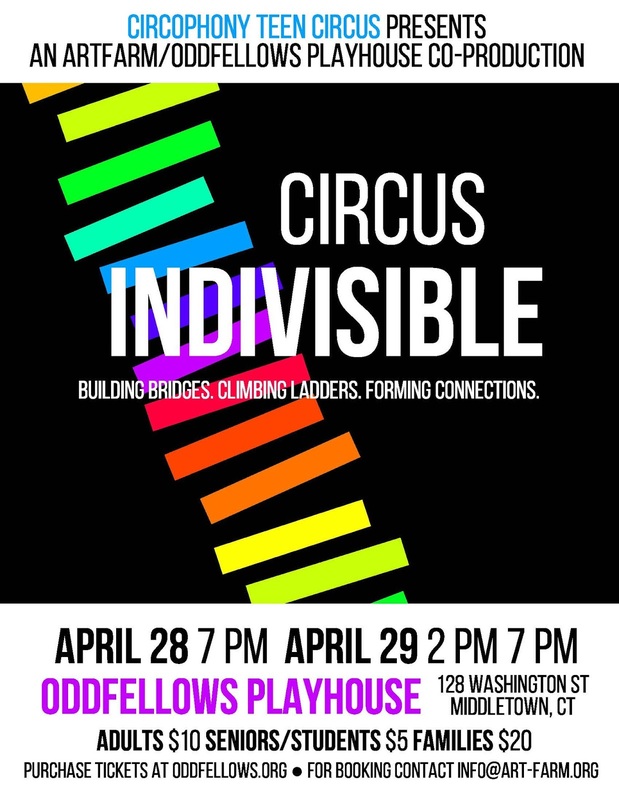 Circophony Teen Circus debuts its newest show, Circus Indivisible, this Friday and Saturday, April 28 and 29, at Oddfellows Playhouse in Middletown. Performances are Friday at 7 pm and Saturday at 2 pm and 7 pm. Circus Indivisible features 14 seasoned teen performers who juggle, perform acrobatics on stilts, fly through the air, ride unicycles, dance, balance on ladders and engage the audience in an exciting new circus about making connections and appreciating differences. The Company’s Roman Ladders begin as walls that divide people, become bridges that bring them together, and ultimately emerge as ladders which take everyone higher. Circophony, now in its sixth season, is a collaboration between ARTFARM and Oddfellows Playhouse. Directed by ARTFARM Circus artists Dic Wheeler and Allison McDermott (who both also perform in ARTFARM’s Circus for a Fragile Planet and Isaac Newton’s Little Apple Circus), Circophony offers year-round circus training for teenagers in central Connecticut. Each winter auditions are held for Circophony’s Traveling Company, and a select group of experienced teen performers develop a new show which debuts at the Playhouse and is then available to tour throughout May and June. This year’s show is Circus Indivisible. For tickets, go to www.oddfellows.org. Oddfellows Playhouse is located at 128 Washington Street in Middletown. Tickets are $10 for adults, $5 for kids, or $20 per family. To bring Circophony to your venue this Spring, contact info@art-farm.org.